Alan Bennett is known originally for plays including Beyond the Fringe, The History Boys and The Madness of King George. He has also built a long and successful career as a television and film script-writer, and has become something of a national treasure. 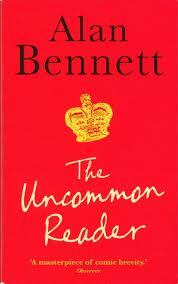 The Uncommon Reader, published in 2007, is a novella about what happens when the Queen discovers books. In this charming and heartwarming story, we see the Queen stumbling across a mobile library around the back of Buckingham Palace. There she meets and befriends one of the kitchen hands, who has his own passion for literature. But not everyone in the household is pleased. The reading starts to take over from official duties. And the Queen becomes less than compliant. Bennett provides wry commentary and pokes a gentle stick (apologies Camilla) at the monarchy - more specifically, all the lackeys and advisors - revealing a very royal, and very real monarch, who is starved of intellectual stimulation. He is not quite scathing, but certainly critical of 'the firm'. This apparently simple tale wears it's quality lightly. Parody, cultural references, tightly written dialogue and characterisation jostle with laugh-out-loud moments. I *loved* this book. Essential reading.